No this is not a joke, he really did announce his resignation today. I am in complete shock and in sorrow at this moment. Benedict cites his advancing age as the cause for his resignation. He is the first Pope to retire since the middle ages. Pope Benedict XVI announced today that he will resign from his duties as Pope on February 28th, 2013. The full text of the Pope's announcement follows. Please revist this page for more details. A press conference will be held in minutes at the Vatican press office. I will update this blog post as I learn more. 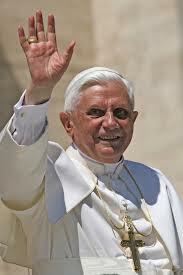 The Holy Father, Pope Benedict VXI has decided to resign due to age. He stated in his letter that he is not able to carry on the duties of the Papacy due to a decline in health. Some speculate that he is suffering from a congested heart; however, the Vatican has announced that his resignation is not due to any illness. It was obvious that Pope Benedict always had in mind the possibility of retiring. This is not the first time a Pope retires. Pope Gregory XII in 1415 was the last Pontiff to retire. It is rumored that Pope Benedict and his brother had planned to retire and live together. The Vatican has stated that Pope Benedict will be living on a monastery in the Vatican.